The Unintended Consequences of "There's an app for that"
Unintended consequences: There’s no app for that. In the smartphone, uber connected world in which we live, every problem can seemingly be solved by an app. Don’t do accounting? No worries, there’s an app for that. Don’t do scheduling? No problem. There’s an app for that. Apps for staying in touch with family and friends that aren’t facebook? Check. Apps for solving complex math problems? Check. Apps to entertain 2 year olds: check. And now with voice activation, Alexa and Siri will take care of all that with your voice. Apps for introverts wanting to meet introverts but afraid to come out and play? Don’t know, but I’m assuming ithey’re out there. And while these apps are wonderful and useful, something subtle is happening to us. We no longer know how to solve problems. The Handyman is gone. The struggle is gone. The guy or gal who knows how to do a little of everything. The biggest problem of this is that when we solve all our problems with apps, we are stuck in an increasingly deeper rut of “one solution”: There’s an app for that. But we never know the satisfaction of having to struggle through and overcome our problems. Because someone already solved that problem. There’s an app for that. And yet loneliness is increasing. Depression is increasing. Anger and outrage are all over the place. More information, less knowledge. 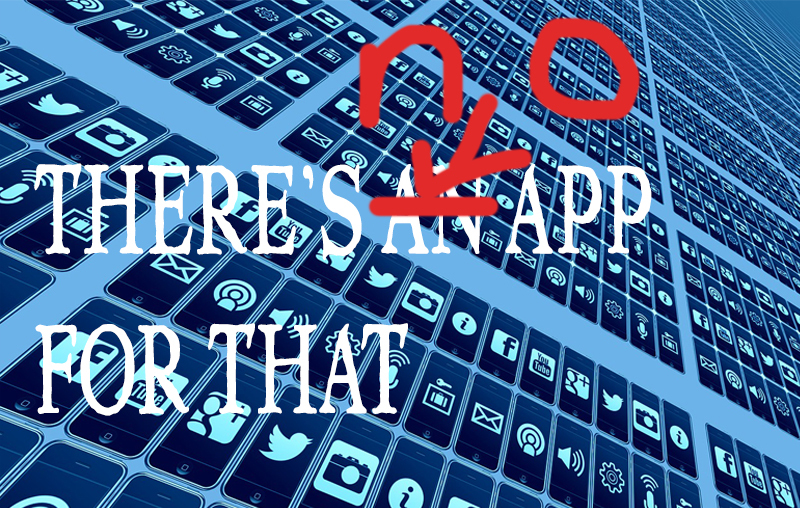 There’s no app for that. Some research even strongly connects “that” with the apps. Because it’s the PROCESS that grounds the learning. The PROCESS that moves growth. The Process that takes learning in one area and applies it in another. A process that must people. Someone wrote that app. Someone had that problem that was solved by that all. You can learn a language using an app. But you can only speak a language by interacting with another person. You can learn music on youtube, but you can only enchant by playing music. By yourself in your room, or better yet, for an audience who loves you. You can find a date online, but you go on a date with a person. You can find a house online, but you only find a home by personally being present. I’m always on the lookout for easier ways to do things. Maybe, just maybe though, sometimes the easy way out isn’t the best way, and the hard way is more fulfilling and personally satisfying.